. . . . . . . . . . Step 1 . . . . . . . . . .
Be sure that grade has been properly leveled and load tested if necessary. Erect Globalite® Foundation Forms, following the engineered form layout drawings and details provided by SCI. Install 6 mil Vapor Barrier if required. 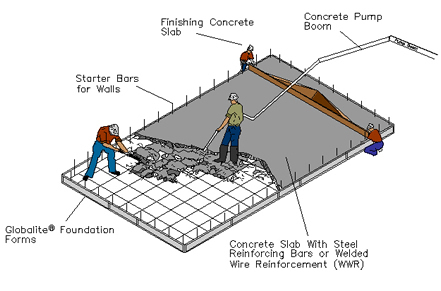 Install Welded Wire Reinforcing or Reinforcing Bars. Place concrete and finish to specifications. Protect concrete from adverse weather conditions if necessary during curing period.